It’s still chilly out, but the sun is shining. I want winter food, but I also want to wear skirts without tights even if I get goosebumps. 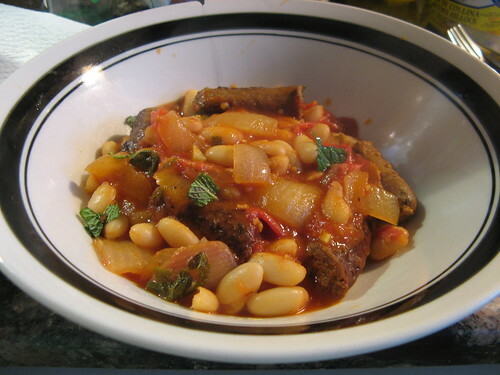 This recipe combines fresh springtime flavors like lamb and mint with a hearty bean stew in a tomato base. It’s adapted from Joyce Goldstein’s Mediterranean the Beautiful Cookbook, which looks to have adjusted in price since last we cooked a recipe from it. Go get yourself a copy.